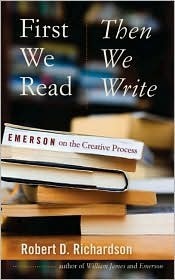 I found this an enjoyable short read with many thought-provoking points for a writer. Robert D Richardson Jr. has done an excellent job of drawing together Emerson's views and philosophies and has presented them in a concise and interesting way. This is not a general book that will appeal to just anyone because of its very particular subject matter, but I think it will be of interest of many writers for its comments and ideas about the creative process and the nature of writing.